Page of "The 3 Faces of Karate". It is often debated what is of most importance to achieving success in the Art of Karate. Some speak of the emphasis on the 3 K’s, as in Kihon, Kata, or Kumite. The same with talk on whether one should concentrate more on Speed, Power, or Technique. Of which there are varying opinions and preferences on the above. Some even say that to truly understand Karate one must practise the 3 battle form or Kata named Sanchin every single day. In many respects even though all of these points of view are valid, the answer to the whole though I feel is much deeper. The Japanese say that you have three faces. The first face, you show to the world. The second face, you show to your close friends, and your family. The third face, you never show anyone. I have always believed that the answer to a person’s true understanding of Budo and Karate lies somewhere within the above saying. Similar in many ways to this Western saying; You may fool some people or others some of the time, but you will do well to truly fool yourself. This whole concept and way of assessing through differing perspectives, or 3 faces, is often prevalent within Karate, even if we don’t always realise it. The triangular approach through definition is where by many Karate Ka can have clear to see failings with this 3 faces approach being the only remedy. It is however our own choice on if we wish to look in the mirror and be honest with ourselves and our Karate. Karate generally is a personal battle, you verse yourself. However, like it or not, the basis from which we study and are taught the Art isn’t all about oneself, as without both a Sensei and fellow Dojo training members of worth you will do well to progress very far, or if you do, there will always be important elements missing. Yes, the battles faced are our very own and much of our training is to be done alone. Sensei or mentors though are like invaluable wise old elders that are not just there to teach us how to fight, but to help keep us mentally grounded and balanced, just as the hands-on experience of working with training partners keep us physically in tune with reality. I always advise any of my students that are working towards gradings that they must go out to achieve approval from all of the 3 faces that are judging their Karate. Their Sensei – Their fellow Dojo Training Partners -Themselves. Of which if all 3 faces honestly feel that one is worthy then there can be little doubt. Is to lose a face in reality is failure. The answer to gradings can be found in the words of Feynman. The first principle is that you must not fool yourself and you are the easiest person to fool. The best advice that a Karate Ka can ever receive is that the basis of ones Karate should always be about training. As regardless of what face one may show to the world through teaching and study, if you are not regularly training yourself then all you are really doing is fooling oneself and others. This in truth is not Karate. All of you reading this in the outside world will have a perception of my own personal Karate, my close students will also see sides to my Karate that you won’t ever see, just like my Sensei will see my Karate in a way that neither group will see either. The goal though is to always be honest to all, and more so to myself through my actions and the Karate training that I do alone. 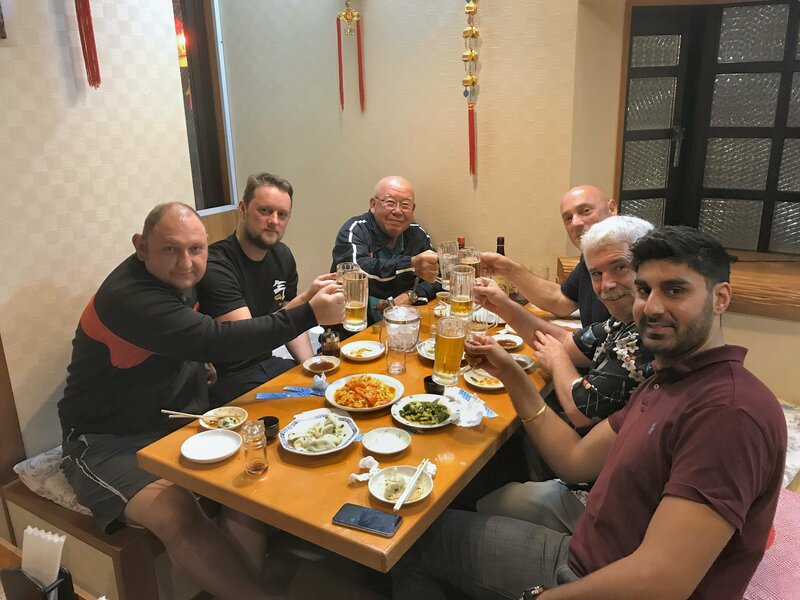 There are Karate students and teachers from around the world who commendably visit Okinawa to further their understanding of the art, some regularly. Many though then go away preaching or teaching students on a platform or basis that has no reflection of the Karate training that those on Okinawa truly do. Does one then fool the Karate Sensei of Okinawa, others, or themselves?? The answer is neither, as all faces are let down… Just like I say to my own students, if there’s something that you wouldn’t do in Okinawa or in front of Senaha or Tamaki Sensei’s, then I don’t want to see you doing it over here in England. Always remember that the basis of ALL Karate on Okinawa is in the training, not just talking or teaching. With the aim being in always pleasing the 3 faces….